Ever tried tamarind? Not the monkey, the tropical knobbly wild fruit that grows in the wilds in Africa and is widely used in Indian cooking. So much so that it’s called the ‘Indian date.’ I wouldn’t recommend eating it raw, you’ll involuntarily make a strange facial expression – the kind that gives those around you a nervous disposition. That’s because it’s got the sourness of a lemon but it is quite sweet too. It’s got the same sort of sweet / sour balance as pomegranate molasses do or a really really intense fizzy cola bottle. In any case – it’s perfectly paired with coconut milk because it gives this curry a creamy sweetness with a bit of a kick. You’ll also need a lidded pan for this dish. Pop the oil in the pan and get up to a medium heat. Add the onions, cinnamon stick and curry leaves and cook for around 10 minutes until they’re do keep stirring every now and then to ensure they cook evenly. They should be lovely and golden. Now add the grated ginger and garlic, stir for a couple more minutes and add the rest of the spices and the salt and sugar. Stir again and add the chicken. You want to seal the chicken, cooking it for around 6-8 mins. I pop the lid on the speed up the process. After this time add the tamarind paste, stir and add the coconut milk. Stir again and pop the lid on for around 30 mins on a low to medium heat – stirring every now and then. Wow. Looks so good. Thanks for sharing. Hi Meera, your website is great. Wonderful recipes & I will surely try some of them. All the best on your venture!! This looks gorgeous – one to make once the children are asleep! Thanks, how nice of you to say so! I’ve just been to an inspiring foodie demo given by Anna Hansen of Modern Pantry, who uses some amazing spices in her cooking, too. Feeling spicy. 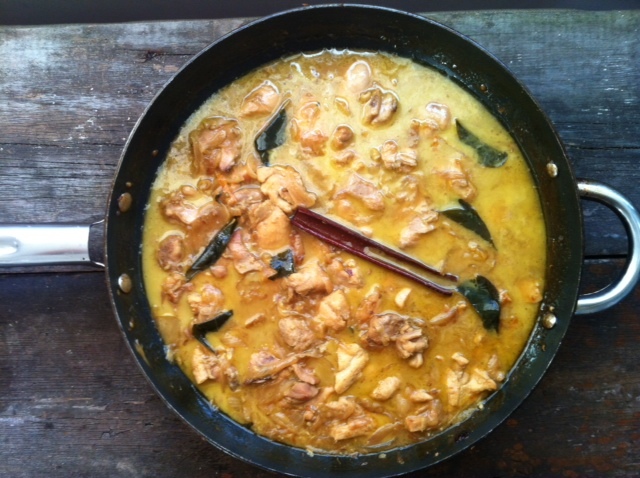 Hi Meera, I just made this curry from your book and I thought it was absolutely delicious, as did the rest of my family! I’ve tried several other dishes such as the spiced cabbage and the aubergine curry, and everything has been a success. Thank you for such a wonderful recipe book! I LOVE this dish!! I bought your cookbook one month ago and have made this curry at least once per week. The original recipe is wonderful! I have changed out the chicken for chickpeas, another time I used chicken + chickpeas + butternut squash, and another time used sweet potatoes + chicken. All dishes were amazing!! Thank you for this great recipe. this was fantastic, i made it for a church dinner and it had just the right amount of spice to be super flavorful, without knocking out my episcopalian friends. i used whole chicken thighs and threw in a few drumsticks and cooked it a bit longer. also low fat coconut milk works well here. i served it with caramelized onions and jerra rice from the indian kitchen cookbook which was also fantastic, but can’t find the recipe on this site.